The time went by too quickly. I didn’t get to see everything I wanted to, in particular the SAQA masters art quilts. Classes were fun; the teachers energetic, enthusiastic, and knowledgeable. I took four, two on Monday, one on Thursday and Saturday. I came home with one completed project, finished another one yesterday, and have just two left to complete. The crowd was visibly smaller which made for easier looking and shopping and smaller classes. A lot of folks dressed up for Halloween—I went as a shopper complete with shopping bag, purse, and cross-trainer shoes—no pink cowboy hat this year. 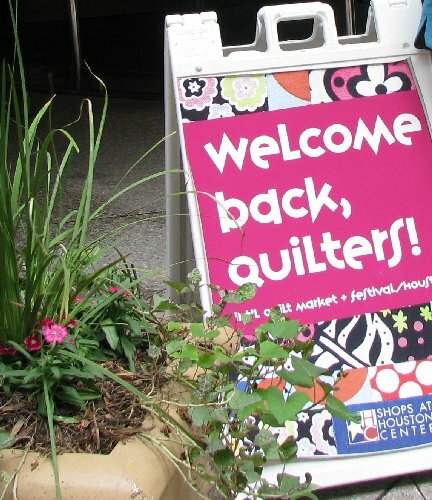 I spent one evening guarding the DAR quilts and collecting tickets at the door. Some folks grumbled over the delay—over three hundred people in less than eight minutes through our door—and we had to figure out how to work the scanners. Other folks were there to have a good time. I still have to figure out how one of the edges was made on a DAR quilt and email new friends with the directions. The Bernina Fashion show was great fun; the models very professional and the garments fabulous in their detailing. Everywhere I turned, someone knew me and called out my name. Kim Son and Doozi’s are new favorite places to eat. The final reveal of the fabulous fabricators occurred on Saturday amidst much laughter—friends are such a joy. My accommodations this year in the museum district couldn’t have been better. I wore a pedometer each day and logged in over 5 miles. No wonder my feet were tired at the end of the day. Too bad Festival is over until next year.